Last time I started to write a full game guide, it was the “COD4 Multiplayer/Headquarters Survival Guide”, and it remained unfinished at 13500 words (complete at around 75%). I will not make the same mistake twice! Instead of publishing a full “BFBC2 Multiplayer/Rush Survival Guide”, I will publish parts little by little, then eventually compile them all together. in-game. When you come across a good player send him a friend request (that’s for the consoles, I am not sure how this works for the PC version). in the forums. A lot of us are active in at least one tech/gaming forum. In every half-respectable gaming forum there are threads with its members’ gamertag for that exact purpose, so it’s rather easy to round-up teammates. 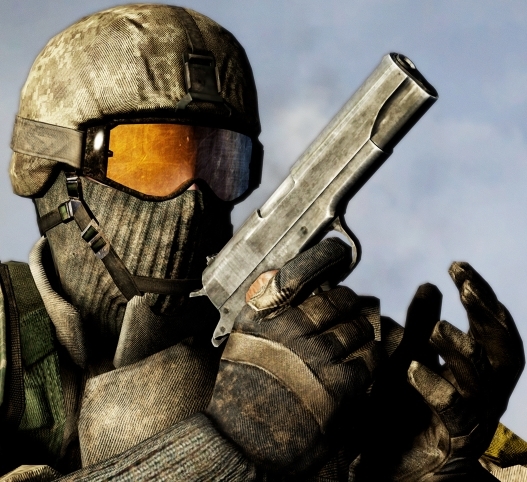 If you’re not part of any forum, then a safe bet is to join the official BFBC2 forums. in blogs, etc. Guys like Donncha have cool gaming blogs, you can check them out and send them a friend request. Once you have a few friends, you can form a squad and either play a Squad mode (team deathmatch or Rush) or join a full-size Rush or Conquest. If you would like to play with more than three of your friends at a time, you have to do it the hard way. If you’re a Xbox user, invite all of your friends to a party in order to be able to communicate. If you’re really a lot and want to communicate easier between squads, split up the parties. Form with three of them a squad. Find a game and hope it’s not full. If it’s full you can either quit or the rest of the players must be patient until some slots are freed. If the game has 4 or more slots for free, then you can have a full squad joining the game at a time, if the player who has formed the squad does “Join session in progress” (again, that’s a XBL control). Otherwise the rest of the players can join little by little in the same way. If the players who are already inside the game send an Invite, that should work too. If a player who joins the session ends up in the enemy team, he can either quit and wait for the in-game players to let him know when a slot is free in their team, or play until the end of the match with the enemies and check out often if a slot is free on his friend’s team and try to join. That might be the most convenient, because your friends in the heat of the action, may not be checking that often available slots. This might take a while to get everybody in the same team, maybe an hour. But once everybody is in, the good news are that you won’t be separated, and the real fun begins. You can have a team of up to 12 friends going on for the whole day if nobody quits. When somebody leaves, it might take one or two matches for a new friend to join, since the game will pick up another random player to fill the vacant slot. I am not really sure why DICE hasn’t made it possible to form a full team of friends, maybe for team balance purposes (a full team of players who know each other can be almost unbeatable) or for technical reasons (because of the way the game structure’s is based on squads). I hope this feature will be added in the future. Thanks for the shout out! Hopefully we can get into a game together some night. Hope you don’t mind… I added you. I have a variable 3-5 friend (outside of the game) squad that I play with, almost nightly, that has been looking for strategic players to play with. Hope you don’t mind. Not at all, I hope to be online on the Xbox tomorrow night, although it’ll be after 9pm Irish time, so possibly 11pm your time. Gotta wait until my son goes to bed unfortunately.